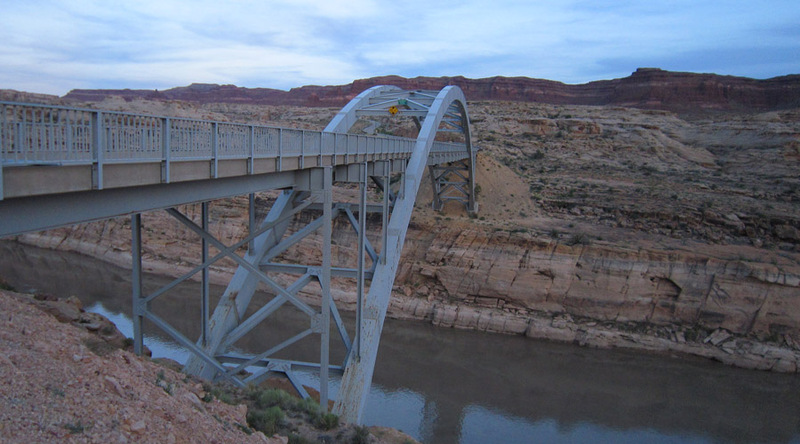 Escalante to Monticello 2010 — Part 2 – Across Utah! Started the day by heading out cross-country to the East. I was not able to get up the side canyon as I had hoped, so I had to retreat to an area where a rockslide allowed me to climb to plateau top. Once up on top it was easy going across the arid landscape headed toward Mt. Hillers. Along the way I did run into some patches of ground vibrantly streaked black with coal I presume. 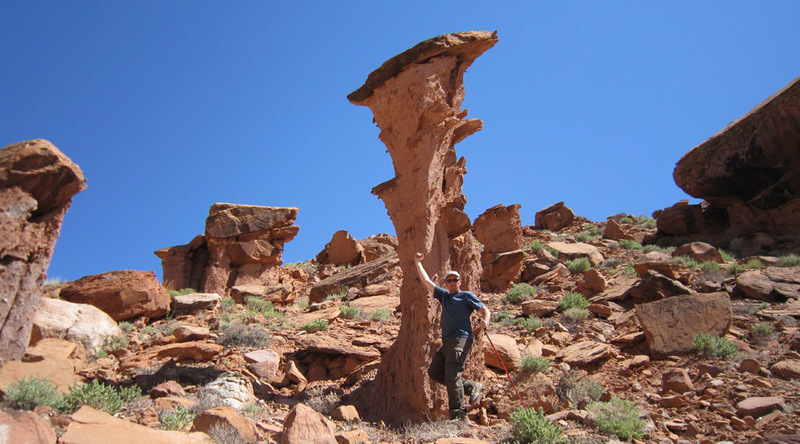 There was also a really cool balanced rock out there. I eventually picked up a cattle trail which made its way across the landscape. 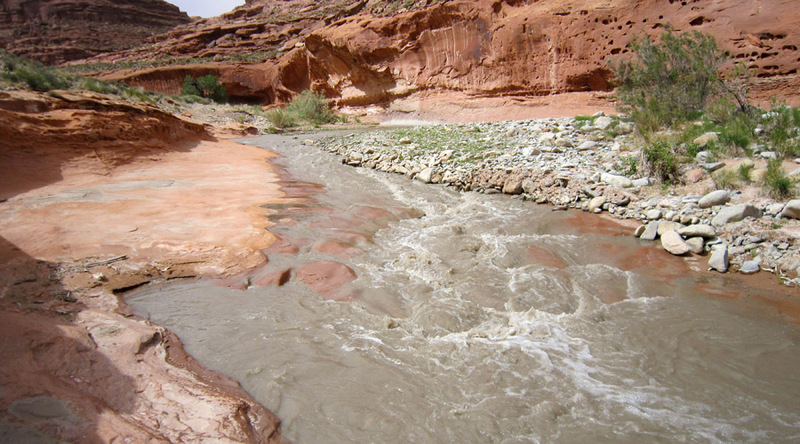 At one point it even intersected a small stream, though it looked too polluted to drink. Finally I crossed Bullfrog Creek which ran very silty. I grabbed some water just in case and hiked farther east hoping for better options. It was a steady climb through more barren mudhills. I was approaching the foothills of the Henry Mountain near dusk when I finally saw a few cottonwood trees up ahead. I headed that way and was pleased to find a nice, clear flowing stream and made camp. I left creek campsite in morning and followed the creek a little farther east before setting out to climb to the higher bench. The wildflowers were great, but it was a steep climb to gain the plateau which abutted the mountain. At mid-day I picked up a gravel road which led me to a spring where I got more water. Here I ran into a few groups on ATVs — the first people I’d spoken to for days. From here the road turned down the mountain and I headed off trail up flanks of Mt. Hillers. I made it a way up mountain and then it got extremely tough. I finally had to retreat as the terrain got very steep across loose rock with the wind gusting like crazy. I explored the cool outcrops of rocks for a while and then actually camped atop some of the rock fins on the lower flank of the mountain. 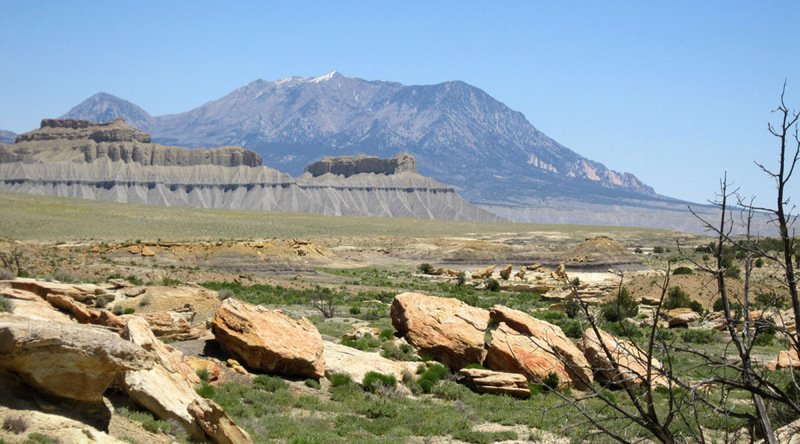 I enjoyed really great views of the “Little Rockies” all the way back to Deer Point in Capitol Reef. Made my way back down the steep slopes on the southern side of Mt. Hillers. 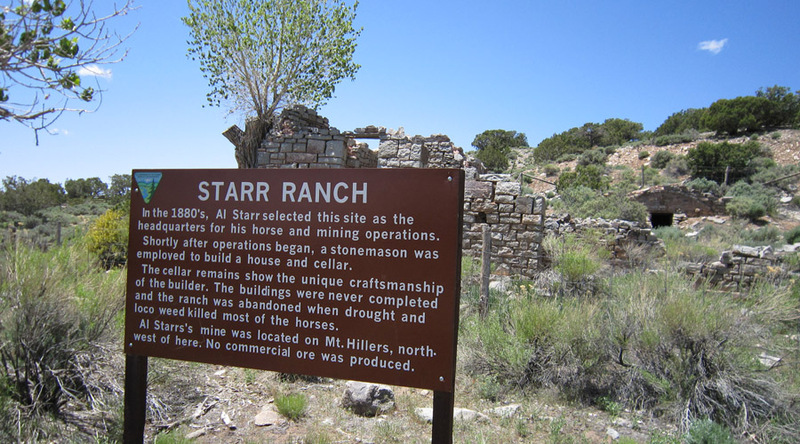 After getting some water at Starr Spring, I checked out the ruins of the old Starr Ranch. 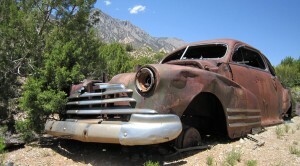 As I was headed back down into canyon country I came to a dump of old cars along the way — it was actually pretty cool. There were probably 20 old cars dumped here. I had been following a dirt road around the mountain when I reached the point I wanted to loose elevation and head directly toward the canyons. 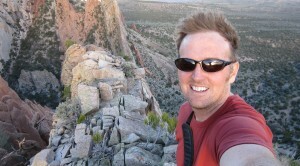 I had to find my way down off a high ridge and down onto the land of Navajo sandstone domes below. They were cool to cross and I found an unexpected waterfall in Upper Trail Canyon. It was windy all day with extremely high winds at times. I went “under” highway 276 via the culvert and then headed down Trail Canyon. This route was really no fun as the dry wash was full of cobblestones the whole way which just begged to twist my ankle with each step. Near the junction with Trachyte the canyon became more entrenched and some water began to flow again. I camped at the junction at a nice spot overlooking the Trachyte. 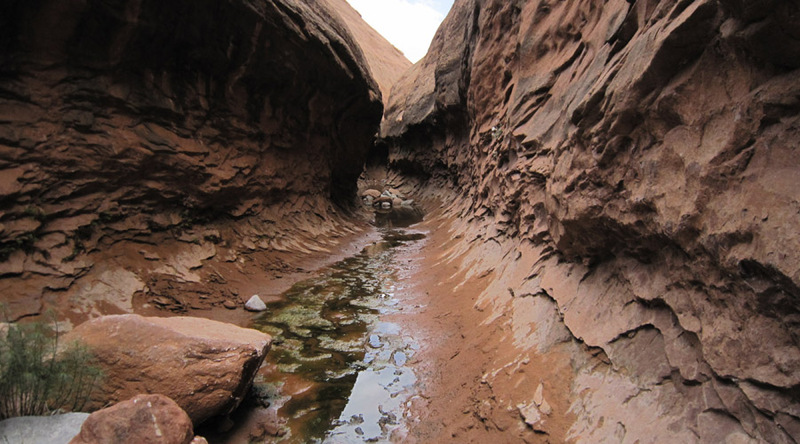 I hiked up Trachyte Canyon for a side hike to check out Maidenwater Canyon. It was brushy at the bottomw, but well worth it. The middle section had some really good narrows. I had to get through chest-deep water at two different spots. 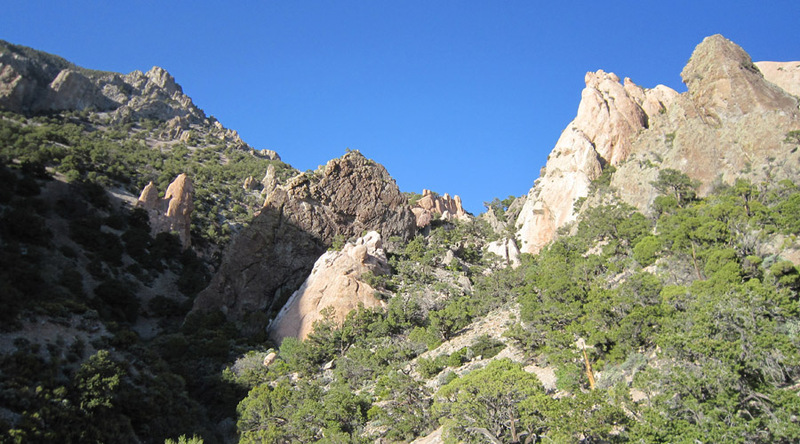 I stopped at the main obstacle in the canyon — a big boulder requiring a short climb up out of a pool. I tried it out and it was pretty tough w/o a pack. Not that it was that tall — just hard to get a firm grip/footing coming out of the water. Going back south into the main canyon, it became very windy once again. It was hard to walk at times with the wind gusting so strong. The sky was brown with dust and sand in the air. Trachyte Canyon would be beautiful if not for the gray water. The orange rocks are cool and there are a few really cool short, but deep, undercuts. I made it to Lake Powell late in the day with wind still blowing. The lake was lower than I expected. Beef Stew for dinner. The wind finally calms down in the morning. During the night I heard a small rockslide and then a kitten crying near camp. I wanted to go and investigate, but I convinced myself that that was a bad idea to go looking for it. On my own trail, I made my way around the lake high on the cliffs. 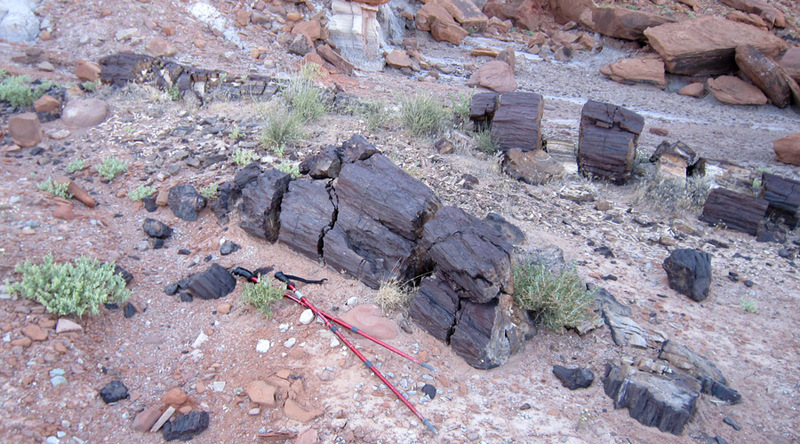 It was tough work at times, but I saw awesome balanced rocks and lots of petrified wood. Being low on water, I went down as low as possible to lake’s edge but the lake was still below me off of a sheer cliff. I got out a 30′ rope and “fished” for water my water bottle. Got it!! If the lake had been one foot lower, I would have gone thirsty as it took every bit of the 30′ rope to reach the lake. Cold tortellini for dinner as I ran out of fuel for my stove. 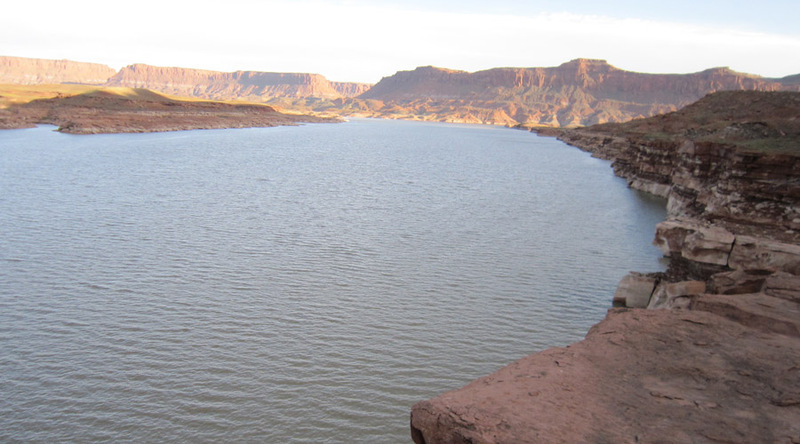 Continued around Lake Powell high on the cliffs above. It’s a very slow go as there’s no trail to follow. Finally I get to the end of the lake at the North Wash bay and find a place to climb down. Once at shore I realize that I had come down too soon as the lake continues hugging the cliff around the final bend. Rather than retrace my path, I decide to swim across this bend of the lake while floating my backpack on my sleeping air mattress. On the other side, I climb up to highway 95 and then had a very looong road walk to get to my next cache. It had been a very long, hard day but it was good to be at a re-supply point and to have hot food again!! Continue the journey with Escalante to Monticello — Part 3. Tagged Capitol Reef, Henry Mountains, Hite, Lake Powell, Maidenwater Canyon, Mt. 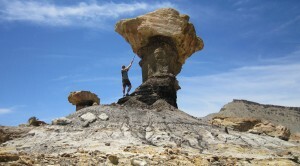 Hillers, Pedestals, Petrified Wood, Slot Canyon, Swett Canyon, Trachyte Creek, Utah, Woodruff Canyon.